Thermoelectric Cold Plate suits high-power fiber lasers. Intended for fiber laser OEM or laboratory cooling applications, Model OCP-110 provides 110 W cooling capacity when set temperature is same as ambient. Set temperature can be 48Â°C below ambient when heat load is zero. All thermoelectric coolers in device are environmentally sealed so that OCP-110 can operate at below dew point set temperatures. 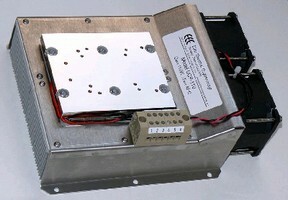 Side-cooled by ducting air through high-density heatsinks, copper plate accommodates lasers made by QPC, LIMO, and nLight. Elite Thermal Engineering, a leading supplier for laser cooling solutions, introduced model OCP-110, a thermoelectric cold plate for fiber laser OEM or laboratory cooling applications. It provides 110w of cooling capacity when set temperature is same as ambient, and the set temperature can be 48ºC below ambient when heat load is zero. All thermoelectric coolers in the device are environmentally sealed so that OCP-110 can operate reliably at below dew point set temperatures. OCP-110 has a copper cold plate that provides much lower spreading resistance than aluminum. Since its inception, ETE has been focusing on high performance cooling products that provide the highest cooling capacity per unit volume for photonics industry. The demand for higher power fiber lasers is driving the development of ever-higher power pump lasers. Elite's model OCP-110 is designed to temperature stabilize the most popular fiber coupled laser diodes with mounting patterns that can accommodate lasers made by QPC, LIMO and nLight. Most of the high power cold plates on the market are impingement cooled for its low thermal resistance; but it requires substantial open space in at least 3 sides of the module and it is hard to integrate them into laser products. ETE's model OCP-110 is side cooled by ducting air through high density heatsinks; but with a high density heatsink and a set of high performance fans, OCP-110 provides more efficient cooling than what's on the market; it provides all the mounting features for directly integrating in a laser product; and it occupies less space than any cold plates on the market at 110w cooling capacity; OCP-110 also provides high quality screw terminal block for ease of connection. For more information, please contact Elite Thermal Engineering today at contact@elitethermalegnineering.com or call (425) 770-8147, or visit Elite's website www.elitethermalengineering.com.